Description of Focus Group. Explanation. A Focus Group is a qualitative research method in marketing. A focus group consists of a carefully selected representative range of people who discuss and provide feedback about aspects of a product, service, issue, idea or advertisement. The group is 'focused' in the sense that it involves some kind of collective activity. Focus Group interviews were first described in 1946 by Robert K. Merton and Kendall and first initiated by Merton in the Bureau of Applied Social Science in 1987. The use of Focus Groups has become widespread in qualitative market research. Its powerful ability to describe or predict market acceptance, consumption behavior or customer satisfaction made Focus Groups a valuable marketing tool. In practice a researcher puts together a group of people, usually ranging from 8 to 12, who represent potential or actual customers of a product or a service. For example a toothpaste, a political party or a TV program. The Focus Group freely talks about the needs for the product, advantages and disadvantages, features (packaging, concept, target, advertisement, social implications, etc…) and characteristics implied in the product management. It is common to use a facilitator who helps the group to stay focused on the topic. The purpose is to explore all sides of a product from a customer perspective or a perspective which is at least different from the one of the management. This can then be used to determine the optimal Marketing Mix. Exploratory Focus Group: used to explore a new issue, to generate hypotheses, especially used in pilot project testing. Compare: Exploratory Factor Analysis. Phenomenological Focus Group: try to understand the experiences of the group members; particularly used with groups of consumers, potential customers and opinion leaders. 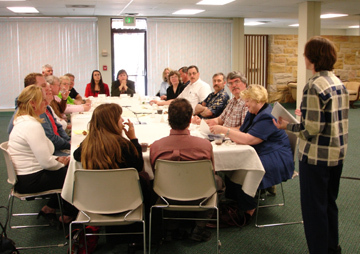 Two-sided Focus Groups, one group observes the other and reports interactions. Dueling Focus Groups, the 2 groups and facilitators take opposite positions regarding the topic. Compare: Six Thinking Hats. Mini Focus Group, group is composed of 4 to 5 members rather than 8 to 12. Online Focus Group, via the internet. Focus groups explicitly make use of group interaction. Alternatives to focus groups include the Delphi Method, Brainstorming, Synectics and De Bono's Six Thinking Hats. Care must be taken when working with Focus Groups to avoid group conformance and conflict avoidance (Groupthink, Spiral of Silence) and any forms of Cognitive Bias which may lead to poor, incorrect, one-sided or subjective results. This ends our Focus Group summary and forum.